A complete redesign has made the 2019 Toyota RAV4 more attractive, more athletic and more advanced than ever before and Bangor-area families are chomping at the bit to get behind the wheel at Downeast Toyota. When the next-generation Toyota RAV4 arrives, it will be available in five trim levels – LE, XLE, XLE Premium, Adventure and Limited – that each promise to upgrade your day-to-day drive. Learn more about popular Toyota RAV4 trim levels with this 2019 Toyota RAV4 LE vs 2019 Toyota RAV4 XLE vs 2019 Toyota RAV4 Adventure comparison. Families who choose the 2019 Toyota RAV4 as their next family hauler will discover a spacious, family-friendly cabin that makes room for five passengers with 37.6 cubic feet of cargo space behind the second row that converts to 69.8 cubic feet with the 60/40 split-folding rear seats laid flat. A 203-horsepower 2.5-liter Dynamic Force four-cylinder engine with a Direct Shift eight-speed automatic transmission comes standard and will earn 26 mpg in the city and 35 mpg on the highway. Toyota RAV4 LE, XLE, XLE Premium and Limited trims are also available with a 219-horsepower Toyota Hybrid System II that will earn 41 mpg in the city and 37 mpg on the highway. A best seller in the Toyota stable of vehicles, the Toyota RAV4 is tailor-made for families on the go. 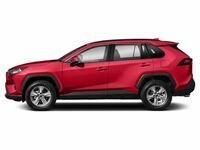 Next-generation 2019 Toyota RAV4 entries employ Toyota New Global Architecture and feature a longer wheelbase, higher ground clearance, 17-inch alloy wheels, Multi-LED headlights and a bold grille design. 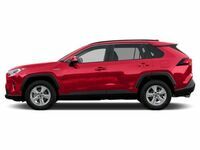 Find the Toyota RAV4 that best fits your lifestyle and budget with this 2019 Toyota RAV4 LE vs 2019 Toyota RAV4 XLE vs 2019 Toyota RAV4 Adventure trim level comparison. The Toyota RAV4 LE trim is anything but basic and comes well-equipped with a base price that starts at just $25,500 and promises incredible value at every turn. Toyota Safety Sense™ 2.0 is standard and will add a Pre-Collision System with Pedestrian Detection, Dynamic Radar Cruise Control, Lane Departure Alert with Steering Assist, Automatic High Beams, Lane Tracing Assist and Road Sign Assist. To keep families entertained, the Toyota RAV4 LE features a 7-inch Toyota Entune™ 3.0 touchscreen infotainment system with Wi-Fi Connect, Amazon Alexa and Apple CarPlay capabilities. Amp up your daily commute when you slide into the driver’s seat of the Toyota RAV4 XLE – which starts at just $27,300 and will build on the features and specs of the Toyota RAV4 LE. Toyota RAV4 XLE entries feature premium fabric upholstery with an embossed design on the front seats, 17-inch alloy wheels, integrated fog lights, a power moonroof, dual-zone automatic climate control, Toyota Smart Key with push-button start, five USB ports and much more. When you pair those elements with a 7-inch Entune™ 3.0 infotainment system, the Toyota RAV4 XLE is a great option for many families. Do you love to take the road less traveled? Look no further than the 2019 Toyota RAV4 Adventure. Tailor-made for the trail, the RAV4 Adventure will start at $32,900 and features a rugged design that employs 19-inch matte-black wheels, 8.6 inches of ground clearance, active grille shutters, a split-bar front grille, RAV4 Adventure roof rails, black exterior accents and more. Inside the Toyota RAV4 Adventure, you will find a more advanced 8-inch Entune™ 3.0 Audio Plus infotainment system, heated and cooled front seats, Black or Mocha Toyota SofTex® upholstery and a 120-volt power outlet. When equipped for towing, the Adventure will tow up to 3,500 pounds – 2,000 pounds more than the rest of the lineup. Visit Downeast Toyota today to get behind the wheel of the all-new 2019 Toyota RAV4!